THE WINNER’S CURSE is easily one of the most-anticipated reads of 2014 so far… And it’s only March! I have to say, I can easily see why there was so much excitement for the new fantasy series from Marie Rutkoski. Just nine pages in and I was already getting a feel for this colorful and history-rich fantasy world (and had a few things feel reminiscent of A Song of Ice and Fire!) so I knew I was going to easily fall into the setting of this book. This book TOYED with my emotions but definitely in a good way. I was intrigued right off the bat, but admittedly, with all of the hype I found myself waiting all-too anxiously to see where this story would go. I wanted to blame hype for that, which it really did factor in to my nervous anticipation a little bit, but sometimes with fantasy I just find myself too impatient in the beginning when everything is getting laid out because I KNOW things are about to go down and I just cannot wait to see what they are. I feel like their was a fair amount of world-building towards the beginning as we get to know Kestrel and Arin as well as the fantastic world created here, but I was so hungry for more information that it was hard to push all my questions and theories aside! The beginning was definitely captivating, but the middle and the end just simply blew me away. I felt like every time a situation presented itself, I totally got knocked over with the directions the story took. Each conflict had so many possible outcomes and I was never quite sure in which direction the story would go and somehow it always ended up being the thing I least expected! I was truly impressed with Marie Rutkoski’s ability employ plot twists and keep the reader on their toes because I felt like I never knew exactly what was going to happen — and as soon as we hit that roller coaster, the book was on an unstoppable path of back-to-back-to-back surprises! I really came to love both of the main characters. I loved Kestrel’s ferocity and of course I can’t resist Arin’s strong, silent, smoldering personality. I felt like they both played off of each other really well too. It took me a while to fall into the groove of the romance but there came a certain point where I was totally hooked. A forbidden romance… It just kills me every time. I really loved the relationship that Kestrel and Arin ended up building but in a way, I wish it had been built up just a bit more. I still loved their romance and it broke my heart and put it back together many times, but sometimes in a non-contemporary setting (even in contemporary too), I need just a tiiiiny bit more of establishing that relationship before I fall in love with. That’s just the most minor of concerns though because I really did fall in love with this romance too! Marie Rutkoski’s writing was just beautiful. She has a fantastic knack for stringing words and sentences together so melodically that the prose just sang to me (which intentional or not for the music theme throughout the book, I don’t know but it totally seemed to fit perfectly). The book was just such a pleasure to read and as well as the prose, the plot seemed to flow incredibly well too. I think one of the only other (minor) qualms that I had was that I was so, so anxious to learn so much more about this amazing world that Marie Rutkoski had created and I felt like I didn’t see a lot of the history until much closer to the end when we got more into the war games and politics. Then again, often times world-building is something I can never get enough of! THE WINNER’S CURSE was a fantastic first installment in this new fantasy series from Marie Rutkoski. As soon as I finished, I couldn’t wait to get my hands on book two…. Which was a shame since technically book one wasn’t even out yet!! This is definitely a thrilling and captivating read and you can bet I’m in this series for the long haul! Kestrel // Character Obsessions: War, fighting, love, honor, piano. I loved Kestrel’s strength, courage, and determination. When forced with the decision to either fight in her father’s army or choose a man to marry, Kestrel wants to do neither and is (not quite hopelessly) caught in the middle. This story starts off with Kestrel purchasing Arin as a slave at the auction in town and… she’s really not 100% sure why she did it. She was quite a puzzle to figure out and I really enjoyed getting to know her character as the story progressed. Arin // Character Obsessions: Obeying Kestrel, war, strategy, motives. Arin was even harder to figure out than Kestrel… and I LOVED that. There were so many different things going on with Arin at all times and it took a while for the reader to also be clued in as to what those things were. I loved his air of mystery as well as his passion which usually lingered beneath the surface. Kept Me Hooked On: High fantasy. Sigh. I just love high fantasy. I love the setting, I love the character development, I love the world building. I love the war, the fighting, the history. I love the romance, betrayal, deception. IT’S JUST SO GOOD. Left Me Wanting More: Early reveals. I didn’t want everything to be given away in the beginning of the book, but I always appreciate a few little clues or reveals or MOMENTS in the beginning. I won’t say it was a “slow” ending, but it did take a while to pick up for me. I read this book along with my other friends in The Selective Collective for our monthly read along! Check out their posts featuring the book below! Daphne & Kristina @ Gone Pecan Interview with Marie Rutkoski + Giveaway! 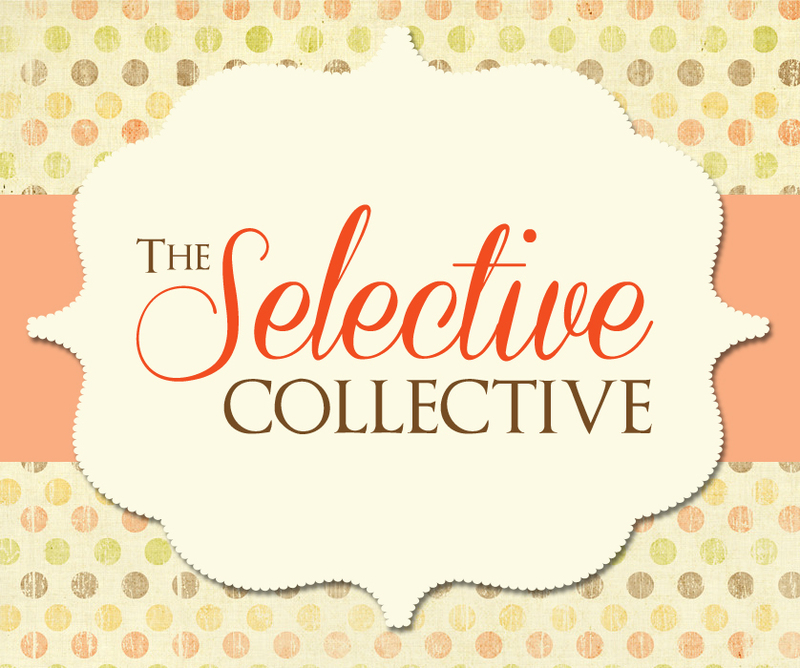 This entry was posted in Books, Fantasy, Review, Selective Collective, YA and tagged Books, Fantasy, Marie Rutkoski, Review, The Selective Collective, The Winner's Curse, YA, Young Adult on March 26, 2014 by Brittany. I’ve read like 10 reviews of this book, but none has made me want to read it more than yours! I’m so excited to go get this book now! Especially after reading all your goodreads updates while reading it! This sounds awesome! Great review! I still haven’t picked this up yet, and like you, I’m nervous all the early hype means I’ll be left disappointed. I’m glad the world building/history is well done, but I have to admit that the romance will have to work if my heart will be engaged. Fingers crossed! Excellent and thorough review (as always). I loved it but realize a couple of our SC friends didn’t quite as much as we did. I thought her writing was so beautiful. There are plenty of fun, fast YA books with conversational prose that’s fine but isn’t amazing or even memorable. Not the case with Marie Rutkoski. Her prose is beautiful. Definitely needing book 2 now after that ending. And love the comparison to Graceling! I can totally see that. Oh my God your Goodreads comments! Way too funny. I got an ARC of this too, so I’m gonna have to start reading now. Wow! I love your review and how you broke it down! 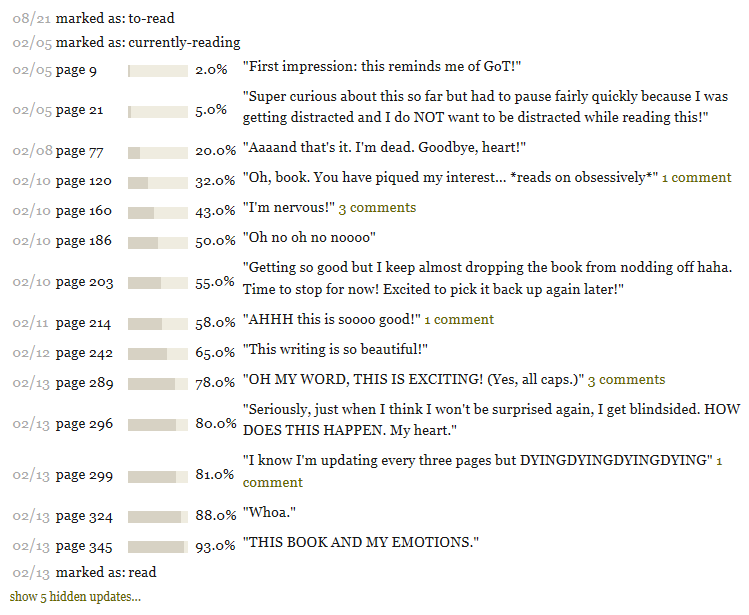 Especially love the timeline of what pages you were on and how you felt at that moment (from goodreads) It funny reading your comments escalate! LOL!! I’m currently reading the book right now. It starts of a bit slow but still very much enjoyable! I’m almost on my 160 (the duel) SHITS ABOUT TO GO DOWN!!! I’m excited!!! This book definitely lived up to the hype for me. I loved it because it has the ultimate forbidden love. I loved it because of the intriguing politics, with the Valorians as the ruthless conquerors and the Herrani people as the rebellious slaves. Even though the Herrani slaves are justified in their rebellion, some of their methods are quite atrocious, and I appreciated that it wasn’t downplayed. The relationship between Kestrel and Arin is slow and progresses quite naturally, and I felt so bad for both of them because they are in a no-win situation. I do have questions about the Empire (I agree with you, we get the history at the end, but I wanted more earlier), but obviously that will be a big part of the next book. That ending…gah! I didn’t see it coming, but it was perfect…and horrible. My heart broke. Great review, glad you loved it! Great point about your impatience as the book sets up the world. That is something I am not used to in contemporary! I know I had this problem with Shadow & Bone too… I thought the writing here was flow-y and beautiful and I really liked the supporting characters in this book too. The struggles seemed real, and even the environment did so I think that added more intensity. I always wish for more dialogue in these books though. I think that’s a problem I’m always going to have and I just need to get used to it. Hopefully I will when I get a few more fantasies under my belt. This is a book I’d really like to win in the birthday giveaway. Thanks for the opportunity and HAPPY BIRTHDAY!